Ophelia Goodnight grew up on tales of brave knights and fair maidens. Now Izzy’s given up yearning for romance. Why did I not listen to other people when they were raving about this book?! I have seriously been missing out on one of the BEST Historical Romance Reads of 2014. Not only is the writing phenomenal, but the characters were amazing to read as they bickered, kissed, played nice, and everything in between. I have so many pages marked with favorite quotes that I might as well just mark the entire story as one. Isolde (Izzy) Goodnight has not only missed her chance at finding a husband due to being ordinary, but she has also lost her family and fortune. While she still has her dignity and the respect of her Fathers fans from his written books, Izzy is alone and broke. When her Godfather passes away and leaves her a castle in horrible conditions, she thinks of it as a way to start fresh and have her castle she always dreamed of. Oh, and she is still a virgin at 26 years old. Ransom William Dacre Vane, the 11th Duke of Rothbury, has been hiding away in his family castle for months. After his intended bride ran away with another man, Ransom went looking for them. When he found them, he was bested in a duel and left blinded from the wound. He now hides from everyone so they don’t have to see his ugliness and he can lick his wounded, injured pride. When Izzy arrives to claim her castle, Ransom refuses to believe his home has been taken from him. Together they make out a deal to where she stays and becomes his secretary while they figure out who has taken advantage of him. Not only did I fall in love with Ransom, but the strength and determination that Izzy had standing up to him, made me enjoy this couple so much more. Izzy refuses to back down from him and it does bring about many memorable scenes and dialogue. Izzy can certainly hold her own against the stubborn and rude Duke of Rothbury! The side characters were wonderful as well! I loved the characters of Duncan and Abigail. I enjoyed them so much that I do hope they are featured again in future books — maybe as main characters even. 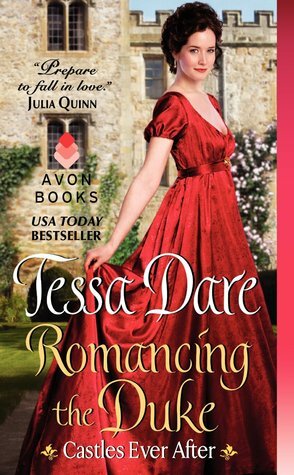 If you are looking for a wonderful tale full of knights, honor, laughter and suspense, Ms. Dare includes it all in Romancing the Duke. A true fairy tale romance to read and be swept up in. I love when historical romances have those head strong females that stand up for what they want. I already own this and I know I really like this author so you have encouraged me to get to it sooner rather than later. I LOVED this book. It made me giggle a lot. Dare has a great way of making you laugh and tear up just a bit. I’m so glad that you enjoyed it as well! I’ve purchased a few copies so that I could loan it out without sharing my copy. 😉 The second book in the series was just released and I can’t wait to dig in to it. Thanks for this great review! It reminded me just how wonderful a read Romancing the Duke is.